The advanced Driver Mode Selector tailors up to eight vehicle attributes using four selectable modes: Tour, Sport, Snow/Ice (excludes V6 1LE) and Track (Track mode is exclusive to Camaro SS and ZL1 and models with the available V6 1LE Performance Package). 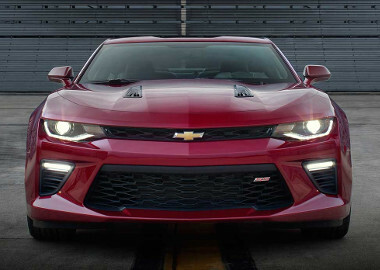 The design of every surface and edge of the Camaro was scrutinized during extensive wind tunnel testing to help improve airflow and performance including the wider opening and precise draft angle of the grille. 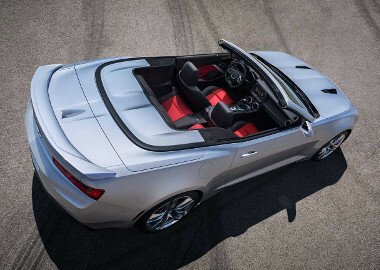 The Camaro Convertible offers the same roof line as the Camaro Coupe with a fully automatic soft-top that seamlessly disappears beneath the hard tonneau cover with the push of a single button – even at speeds up to 30 mph. And with modular underbody bracing, you’ll experience the same sharp, nimble handling as the Coupe. 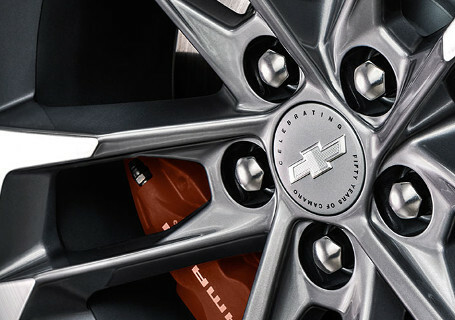 The 20-inch 50th Anniversary Edition Camaro's aluminum wheels feature a machined-face finish and exclusive center caps. The 50th Anniversary exterior decor also includes special badging, a satin chrome-accented grille, a body-color front splitter and Orange brake calipers (front brake calipers only on LT). The Camaro SIX app invites you to download and experience the 2017 Camaro right on your smartphone and tablet. Explore trim levels, make it yours by mixing and matching accessories, and take a 360° spin around its interior.